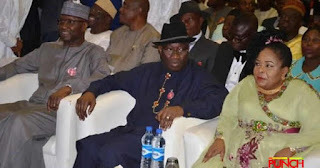 The National Chairman of the ruling All Progressives Congress, Adams Oshimohole, has made a surprise appearance at the venue of Goodluck Jonathan’s book presentation. Is a good Development. Our democracy and politics is taking shape. Going to the next level.